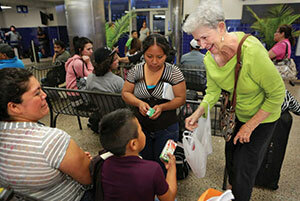 Janice Clayton from the Interfaith Welcome Coalition greets and gives a care package to immigrants in the San Antonio Greyhound bus station. Like most days in San Antonio, it’s hot and sticky. Rosemarie Doucette is wearing her clerical collar, and her shirt is soaked in sweat and tears. She’s just come from the Greyhound bus station where she prayed over a Spanish-speaking immigrant family for safe travel. She is now standing in the front yard of a large mint-green house with white columns. “The church, as a public witness, is called to welcome the stranger, feed the hungry and clothe the naked. Here they are,” she said, opening the door of a minivan. A Guatemalan woman and her children shyly get out of the van and are escorted inside the safe house. 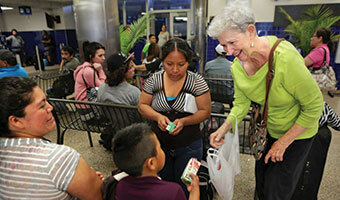 Doucette volunteers with the Interfaith Welcome Coalition, a faith-based nonprofit in San Antonio formed last year to support the overwhelming surge of migrant children and young families coming over the United States’ southern border in the last two years. More are coming to the U.S. According to Lutheran Immigration and Refugee Service, 68,000 children were taken into custody last year coming into the U.S. That’s up from 19,418 in 2009. More than 75 percent of those children are from Central America — El Salvador, Guatemala and Honduras — where rates of violence exceed that in recognized war zones. 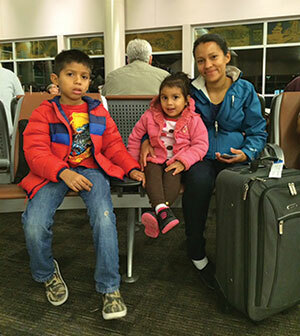 Yanira Lopez Lucas, a 41-year-old woman from Guatemala, crossed the border near San Antonio with her children — ages 16, 14 and 5 ­ —in May. Immediately upon entering the U.S. they surrendered to Immigration and Customs Enforcement (ICE) and pleaded for asylum. 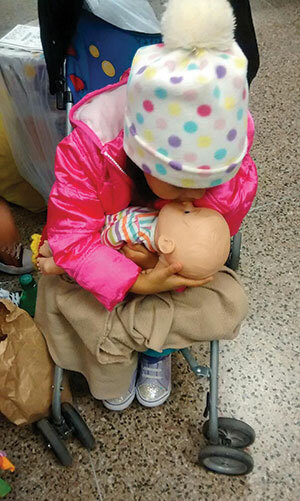 This girl and her mother are among many immigrants who risk the dangerous journey to the U.S. seeking safety. Lopez Lucas made it clear that, given the choice, she would have stayed in Guatemala with her extended family. But she didn’t think her two teenage sons would survive. When Lopez Lucas asked for asylum as a refugee, it began a long process of paperwork. Unlike other forms of immigration, asylum can only be applied for once a person is on U.S. soil. Unlike illegal immigrants, Lopez Lucas’ family and thousands of others­ have crossed the U.S. border in search of legal protection afforded by the U.S. government to people who can demonstrate a “well-founded fear of persecution” or “credible fear” in their home country. When applications for asylum are approved, the families are released from detention centers and taken to the Greyhound bus station. As Doucette reports, the families didn’t always know where they were going. “[ICE] would just bring them to the bus station and dump them out,” she said. A refugee from El Salvador (name withheld for privacy) sells pupusas (similar to tamales) to women at the Interfaith Welcome Coalition meeting to raise money for travel expenses. She spent several months in detention with her son before being released. The women and children were dropped off with a bus ticket. No money. No food. No cellphone to call their family at the other end to let them know when they were arriving. Whether for lack of understanding the English language or for lack of literacy skills, most couldn’t read their bus tickets. Some were taking a three-day trip by bus, with toddlers in tow. Members of the Interfaith Welcome Coalition immediately saw a need to place volunteers at the bus station to help people through the process of getting to their new homes. The safe house was born out of the volunteers realizing that refugees were expected to sleep on the floor of the station with their children until their bus left, which in some cases could be days. 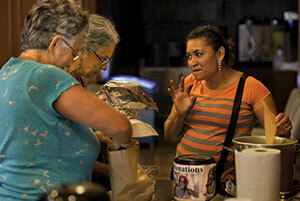 If Doucette finds a family who needs a place to stay until their bus leaves, she brings them to the safe house, which is owned by San Antonio Mennonite Church and staffed by volunteers from local Christian, Muslim and Jewish congregations. A mother and her children (names withheld for their privacy) wait for their bus to travel to stay with a sponsor family while preparing their case for asylum and appearing in immigration court. Before the families leave on their trips, the Interfaith Welcome Coalition provides them with a backpack filled with snacks, a hygiene kit and entertainment for the kids. Every night volunteers and refugees eat a meal together in the safe house at a large wooden table that seats 14. For Doucette, it’s in walking with this suffering that she sees the gospel come alive.